Hi. I am Victor, and I am here to review an e-commerce site with a unique business model. Please stick with me for a while. Their slogan reads “Affordable Excitement”, and they seem pretty much committed to the task, especially where cars and phones are concerned. You may wonder what QuickSell does, and why I have given them a 5-star rating. Basically they only put up the most affordable stuff online. So, all you see on QuickSell are discounted items. As a matter of fact, you CANNOT post stuff on QuickSell until you take a percentage off. The site appeals to both merchants (sellers) and buyers, as there is a separate registration form for each of them. My experience: I had a phone to sell. Fairly used, so I sold it cheaper than the usual price. On QuickSell, you have to specify the discount percentage you want to sell your product for. I think I specified 5%. I got a number of prospective buyers, but I eventually sold to someone close to where I live – which is in Ajah area. The duration of selling off whatever you want to sell on QuickSell depends on two things. One, how much of a hotcake what you are trying to sell is. Two, the discount percentage you have pegged. They also run banner advertisements, but you have to contact them directly and pay a token, to have your products featured, which should sell for you faster. I checked out their forum section. It is just kicking off, and I commented there once or twice, but I believe that when the forum revs up, people can post their stuff on QuickSell and come to the forum to hype it and get people to notice it more without having to pay for the banner adverts. That is what I would do anyway. Admittedly, QuickSell is still in its early stages. Baby steps, I say, but their business model seems sound, and they look genuinely consumer-focused and interested in satisfying their users. Every product on the site has a rating system, so if it is crap, you can just write on there that it is crap. Will I use QuickSell again? YES! Once I have stuff I need to sell quickly. LOL. That is their name afterall: Quick Sell. So, I dunno. Maybe you should check out the site, if you like it like I did, you can come back and comment here. If you didn’t, well, you can also leave your comment here. I will rate it 4 out of 5. I sold my Blackberry Torch at a good buy there and a friend of mine also got his car from there too. Their service is okay. I recommend them. O yes I've heard of Quick Sell Nigeria. It's a trusted and reliable company in Nigeria. A few weeks back, a friend of mine had a Galaxy S3 to sell and within a week. Yes one week, the phone was sold. 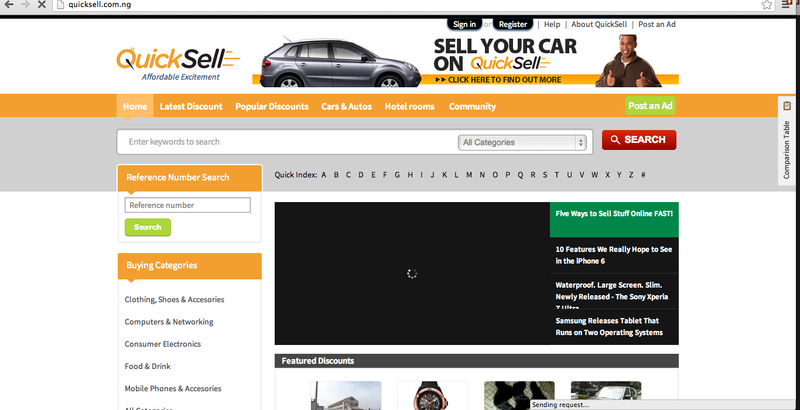 I really appreciate what QuickSell Nigeria is doing, they are really doing a great job!!! 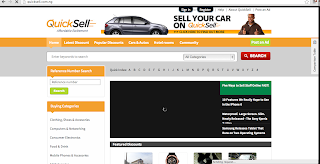 QuickSell Nigeria "Affordable Excitement" for real!!!!! I rate them 3.8/5!!! What ever u wanna sell, u need to holla at them and get ur stuff sold asap! !